After reading the Wikipedia article on D&D Hags, I got to thinking: How about instead of giving one of the pieces of The Tome to the Ogres on Hot Springs Isle, we put it with The Hag in the caves below the Southern Lighthouse. The Hag could use a number of ogres (frequently polymorphed) as minions, and since Hags hunger for humanoid flesh, she could have a minion (human or otherwise) in Swordfish Bay who sends adventurers to meet their death in her domain. Could make for a nice "people are missing" plot in which everyone is traced back to a particular series of assignments from a particular person in town, and they've all been eaten by The Hag. "Hag's Eyes" also sound like a fun toy to incorporate into things, and it could be The Hag's agent that sends people out looking for pieces of The Tome in the first place. She could also be actively using the piece she has (for maximum fun!). Below are the interesting bits from the Wikipedia article on D&D Hags. Hags appear as wretched old women, with long, frayed hair and withered faces. Horrid moles and warts dot their blotchy skin, their mouths are filled with blackened teeth, and their breath is most foul. Though wrinkled and skinny, hags possess supernatural strength and can easily crush smaller creatures, such as goblins, with one hand. Similarly, though hags look decrepit, they run swiftly, easily bounding over rocks or logs in their path. 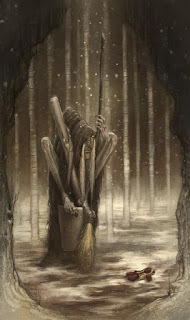 From the long, skinny fingers of hags grow iron-like claws. Hags use these claws and their supernatural strength to rend and tear at opponents in combat. Their garb is similar to that of peasant women, but usually much more tattered and filthy. Hags live alone or in covens of three. They always choose desolate, out-of-the-way places in which to dwell. They sometimes coexist with ogres or evil giants. The former act as servants or guards for hags, but giants are treated with respect (for obvious reasons) and often cooperate with hags to accomplish acts of great evil against the outside world. While individually powerful, hags are much more dangerous when formed into a covey. A covey is composed of three hags of any combination. Covens have special spells and powers that individual hags don't possess. To cast one of these spells, the members of the coven must all be within ten feet of each other and the spell being cast must be in lieu of all other attacks. Covens never cast these spells in combat, instead these spells are used to help weave wicked plots against neighboring human or demihuman settlements. A common ploy by Hag covens is to force or trick a victim into performing some heinous deed. This deed usually involves bringing back more victims, some of whom are devoured by the hags; the rest are used on further evil assignments. Any creature fortunate (or unfortunate) enough to resist a coven is immediately devoured. Covens often use one or two ogres as spies, sending them into the world beyond after polymorphing them into less threatening creatures. These minions frequently wear a special magical gem called a hag eye. A hag eye is made from the real eye of a coven's previous victim. It appears to the casual observer to be no more than a low-value gem, but if viewed through a gem of True Seeing, a disembodied eye can be seen trapped in the hag eye's interior. This hidden eye is magically connected to the coven that created the hag eye. All three members of the coven can see whatever the hag eye is pointed at. Hag eyes are usually placed on a medallion or brooch worn by one of the hag's polymorphed servants. Occasionally hag eyes are given as gifts to unsuspecting victims whom the hags want to monitor. Hags commonly inhabit bone-strewn glens deep within forests. There is a large chance that hags are keeping one or two captives in a nearby earthen pit or forcecage. These prisoners are held for a purpose known only to the hags themselves, though it will certainly involve spreading chaos into the outside world. Prisoners kept in a pit are guarded by an evil giant or one to two ogres; those in a forcecage are left alone. Hags have a ravenous appetite and are able to quickly devour man-sized creatures. They prefer human flesh, but settle for orc or demihuman when necessary. This wanton destruction has earned hags some powerful enemies. Besides humanity in general, both good giants and good dragons hunt hags, slaying them whenever possible. Still, hags multiply rapidly by using their magic to appear as beautiful maidens to men they encounter alone. Hag offspring are always female. Legends say that hags can change their unborn child for that of a human female while she sleeps. They further state that any mother who brings such a child to term is then slain by the hag-child she carries. Fortunately, such ghastly tales have never been proven. Hags hoard fine treasure, using the jewelry and coins to decorate the bones of their more powerful victims, and the finer gems to manufacture magical hag eyes.